Hydrostatic pressure refers to the pressure that any fluid in a confined space exerts. If fluid is in a container, there will be some pressure on the wall of that container. If we picture a column shaped container, we can see that the pressure pushing against its wall is greater at the bottom, than it will be at the top. This is partly related to the force of gravity. The capillaries are the equivalent of a column shaped container, turned on its side. The pressure that blood exerts in the capillaries is known as blood pressure. 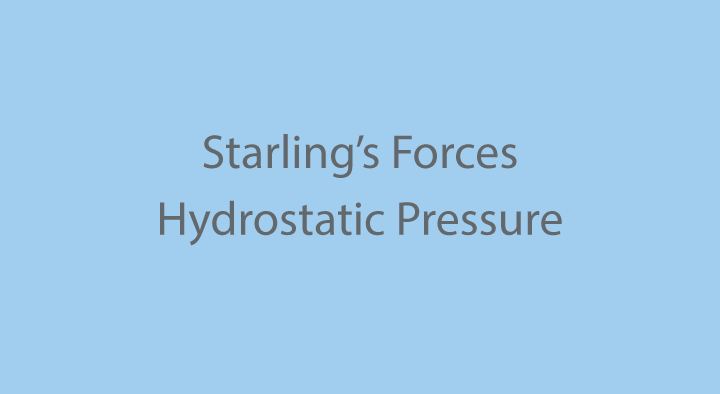 The force of hydrostatic pressure means that as blood moves along the capillary, fluid moves out through its pores and into the interstitial space. This movement means that the pressure exerted by the blood will become lower, as the blood moves along the capillary, from the arterial to the venous end.